The Right Fit. Choosing the Right Printing Method for Every Label Job. Label production demands vary by industry and customer. To meet this range of needs, a variety of print technologies are used, including flexography, digital, and hybrid production solutions. Electronic Imaging Materials (EIM) is a family owned, privately held company established in Keene, NH in 1987. The one location operation has 40 employees. It utilizes over 400 specialty materials to support the needs of more than 10,000 customers based in more than 110 different countries. EIM’s production facility provides custom and stock thermal, thermal transfer, laser, and inkjet labels for clinical, research, electronics, manufacturing, and warehousing. EIM manufactures specialty barcodes and label solutions primarily for the manufacturing/industrial, laboratory, and warehousing industries. “We’ve sold to over 110 countries all over the world,” states Rob Farnsworth, production manager, EIM. Its customers range in company type, size, and labeling application. “We specialize in fulfilling orders that incorporate specialty materials, variable data, and variable color,” says Farnsworth. The majority of its runs are under 2,000 feet, but it has the capability to complete longer runs as well. About 15 percent of the company’s total operating hours are dedicated to digital UV printing. Farnsworth believes that process printing at high speed and image quality for certain applications are the benefits EIM’s customers realize the most with digital printing. “We are finding that digital printing doesn’t necessarily allow for quicker set ups or accommodate shorter runs. 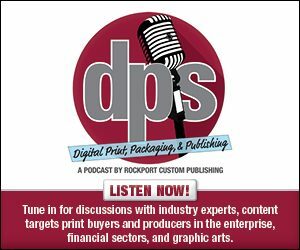 Either converting inline or having to convert prior or after printing adds complexity to prepress, scheduling, and production,” says Farnsworth. To produce its output, EIM utilizes Mark Andy 830 presses, a Jetrion 4830, mPrint mLabel, and several ribbon printing options depending on the label application. The Mark Andy 830 is a value-added flexographic web converting press for self-adhesive label printing. The device is operator friendly with convenient access to print stations and press controls. It features a compact design. The Jetrion 4830, offered by Xeikon, handles web widths of up to nine inches and prints up to 8.3 inches wide. It allows print speeds of up to 120 feet per minute. The mLabel is hybrid labeling solution, featuring inkjet technology with up to six colors as well as finishing capabilities. It features UV curing from IST Metz, as well as finishing functions like die cutting, slitting, perforating, and laminating. It offers an optional thermal transfer module. Additional modules include laminating, RFID inlay insertion, and sheeting. The device offers variable printing capabilities including 1D/2D barcodes, serialization, and customization data. Print speeds run up to 75 meters per minute at a maximum material width of ten inches. The decision to bring the mLabel press in house came in early 2017. At the time the company was looking to consolidate some of its processes and add redundancy to its workflow. While the company is familiar with digital inkjet label printing, adding a UV digital inkjet hybrid press added inline die cutting capabilities. This incorporation was designed to be a major driver in achieving sustained growth in the industrial/manufacturing and laboratory barcode markets. There were some challenges when the company initially installed the mLabel. Converting the difficult materials EIM works with inline, while printing, has posed some hurdles. “We have seen waste continue to be higher than originally thought. Although it is not well beyond other processes, it exceeds previous expectations,” says Farnsworth. Since implementation, the company has moved resources to accommodate training for prepress, estimating, scheduling, and operating. “We have not yet realized any increase in customers specifically looking for a solution that will be more profitable on the mLabel,” shares Farnsworth. The mLabel continues to help EIM consolidate processes for medium to longer runs. It is also exploring options to keep its production flow organic and be able to quickly meet evolving customer needs. The shop is looking at options for replacing its aging Jetrion 4830 with digital solutions from Epson, mPrint, Screen, or Xeikon. EIM recently used its hybrid printing capabilities to produce labels for a longtime customer. The Bread Shed is a local client that produces an assortment of hand crafted bread, cookies, and specialty loaves, which EIM provides the labeling for. This Fall, EIM was tasked with labeling the client’s Traditional Sage Stuffing for the holiday season. The labels for the seasonal product were run in September in preparation for Thanksgiving and Christmas. Farnsworth says The Bread Shed has been a client for several years, and the labels they create for them must be able to withstand a kitchen environment. Preparing the right label for the client’s stuffing involved research and validating different materials, purchasing specific tooling to accommodate different products, as well as color testing, matching, and application testing. Runs for The Bread Shed vary from a few hundred for seasonal products to mid thousands for full runs of traditional products. The order for the stuffing was 300 labels or 250 feet. The job was turned around in nine days. It was printed on the mLabel press and finished with the Zebra/Sohn thermal transfer foil print/converting solution for printing the label’s outer gold foil. “For this run, we actually converted on another press because the foil was a bleed. The majority of the print was digital and the color quality was important to the customer,” says Farnsworth. The Bread Shed’s Traditional Sage Stuffing was originally produced on the Jetrion 4830, but migrated to the mLabel. With this move, color matching took some time. “It was a new press and the RIPping software was also new for us. Now that we’ve had more experience and training with both, color matching is a much quicker process,” admits Farnsworth. The material used for this customer and the regular order volumes made the mLabel a profitable option and resulted in outstanding print quality, says Farnsworth. EIM is able to become more profitable on short-run jobs with a variety of label production equipment. The introduction of a hybrid printing device gives the company the ability to print with digital inkjet technologies and finish with die cutting inline for a streamlined operation. Next week we highlight another case study featuring a hybrid device.